We started baking pizzas at home because everybody likes pizza! After a while, though, we learned that the home oven just can’t bake a pizza hot enough to get the kind of crust that masters like Chris Bianco (of Pizzeria Bianco in Phoenix), George Schenck (of American Flatbread in Waitsfield, VT), or Salvatore Di Matteo (Pizzeria Di Matteo) can make. After a long time studying what they do and characteristics of the great pizza ovens, we built Oven #1 with soapstone left over from our kitchen renovation and some firebrick arranged in a dome on garden trailer we had modified. 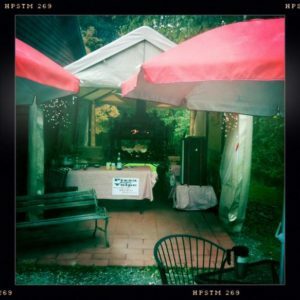 Pizza della Volpe was started as a way to share our passion for pizza with a larger audience. Beginning with the motto “Hand Crafted • Wood Fired • On Location” we set about looking for ways to take our pizza to the people. We got a catering license and set up in a campground where we were able to test our recipes and learn the business of pizza on a fairly small scale. Not long after we got going, some of our neighbors asked if we could serve pizza closer to home, and so Oven #2 was built. That decision evolved into a new setup, in our side yard, where people from our area could get our pizza. 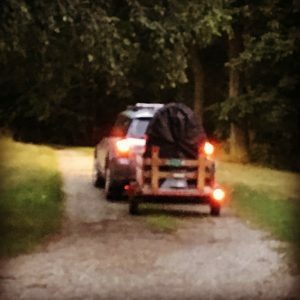 Soon we phased out the campground and focused our efforts closer to home. In the winter of 2010, a chance meeting led to our discovery of a new oven design that changed the game. Oven #3 was smaller, lighter, and still made it possible to bake more and larger pizzas faster than ever. 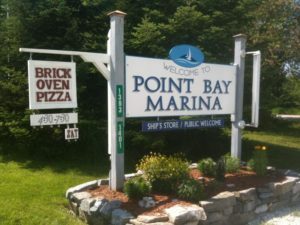 We mounted it on a road-worthy trailer and set up from time to time at Point Bay Marina. We were also available for catering throughout the Pizza Season (May through September) wherever folks needed us to cook for them. Finally, we sold Oven #3, and sent it on its way to make even more people happy. In the interim, we bought some Uuni ovens and have been selling them to home bakers who enjoy a fast and easy wood-fired pizza experience. 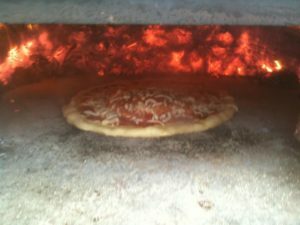 Check out Alice Levitt’s great article about mobile pizza ovens in Vemont (including us)!